Melbourne Refugee and asylum seeker rights rally (7/7/2013) | Credit: Takver [Attribution-ShareAlike 2.0 Generic (CC BY-SA 2.0)], via Flickr. Crimes against humanity have been subjected upon the asylum seekers detained in Australia’s offshore detention centres. Two class-action cases submitted to the Australian High Court report that the camps had purposefully inflicted severe physical and mental trauma upon the refugees. In the words of lawyer George Newhouse, ‘to deter other people from trying to get to Australia by boat in order to seek asylum’. 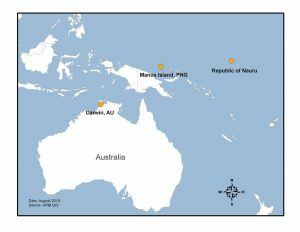 Nauru and Manus Islands | Credit: ARM Climate Research Facility [Attribution-NonCommercial-ShareAlike 2.0 Generic (CC BY-NC-SA 2.0)], via Flickr. Since 2001 with the implementation of the Pacific Solution, which enabled the Australian government to open the detention centres on the small islands of the Republic of Nauru and Manus, there have been multiple reports of disgraceful conditions and treatment of the refugees. Physical and mental torture, sexual and physical assault, severe self-harming and suicides are among the plethora of incidents filed by staff. You can see for yourself the disturbing extent of the problems in this database compiled by The Guardian. So how, then, have these severe breaches of human rights been swept under the rug, with seemingly little mainstream media attention in Australia, and virtually none in other countries? Well, the Nauru government has a lot to answer for. As a tiny country with a population of only around 10,000, Nauru rarely gets much international attention regardless – but their recent curbing of civil freedoms has hardly helped. President Baron Waqa, and his Deputy David Adeang, severely limited foreign media attention in 2014 by hiking visa fees for journalists from AU$200 to AU$8,000. Increased criticism against both the government and the detention centres themselves led to the pair banning Facebook, restricting the ability for opposition politicians, disgruntled citizens and refugees to spread the word of inhumane happenings on the island. The Nauru government aren’t the only ones culpable though. The Australian government are, arguably, the root of the issue. In return for constructing and maintaining the detention centre, the Australians gave the foreign aid-dependent Nauruans tens of millions of dollars. In legal terms, the centres are used for providing shelter for refugees until their status as asylum seekers are verified and they are subsequently allowed into Australia. In reality, however, Australia’s track record of strict asylum policies have left refugees stranded in the offshore detention centres indefinitely. The Australian government even went so far as to make reporting to the media about the happenings within the detention centres illegal in 2015 under the Australian Border Force Act, punishable by up to two years imprisonment. This confirmed that the Australian government didn’t just turn a blind eye to the human rights abuses, but actually supported the Nauruan government’s censorship efforts, all in the name of barring hundreds of Middle Eastern refugees from the asylum in Australia and threatening any other potential seekers from doing so. Thankfully, in the past few months, it seems word of the crimes against humanity being committed on Nauru and Manus Island have been spreading. In October last year, Australian MP Julia Banks became the first member of the government to publicly demand that all children and families detained in the detention centres be brought to Australia, following over 30 children in need of urgent medical attention being brought over in the previous two weeks. 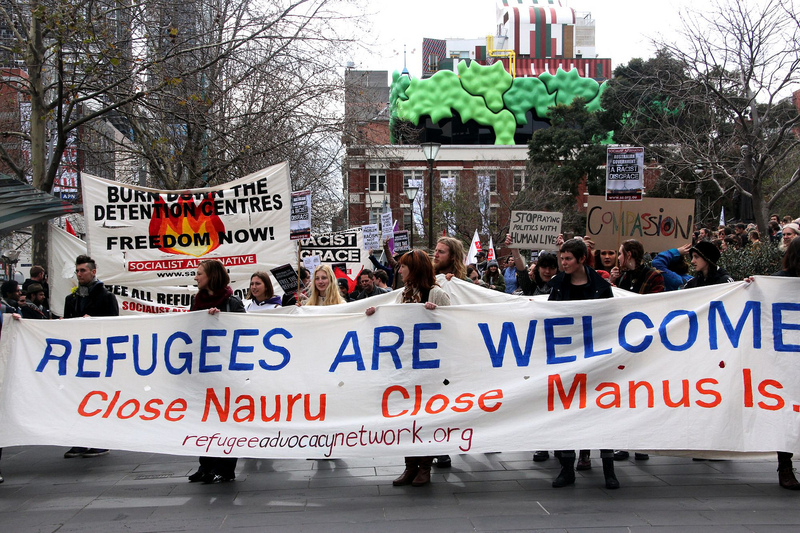 Much protest against the detention centres have since been sparked within Australia – so when will this awareness make itself known internationally? The minuscule size of Nauru and Manus Island, along with their governments and Australia’s efforts to limit press coverage certainly don’t help the situation. Personally, I had no idea Nauru existed at all until a few months ago. It’s very likely that our own country’s political turmoil is overshadowing what initially seems like a minor problem on the other side of the world – so as a result, I urge that we spread awareness of these atrocities ourselves. Even if our country is not prepared to tackle this issue at the moment, the gradual increase in international pressure can, soon enough, save thousands from their lives of abuse, suffering and suicide inside detention centres.